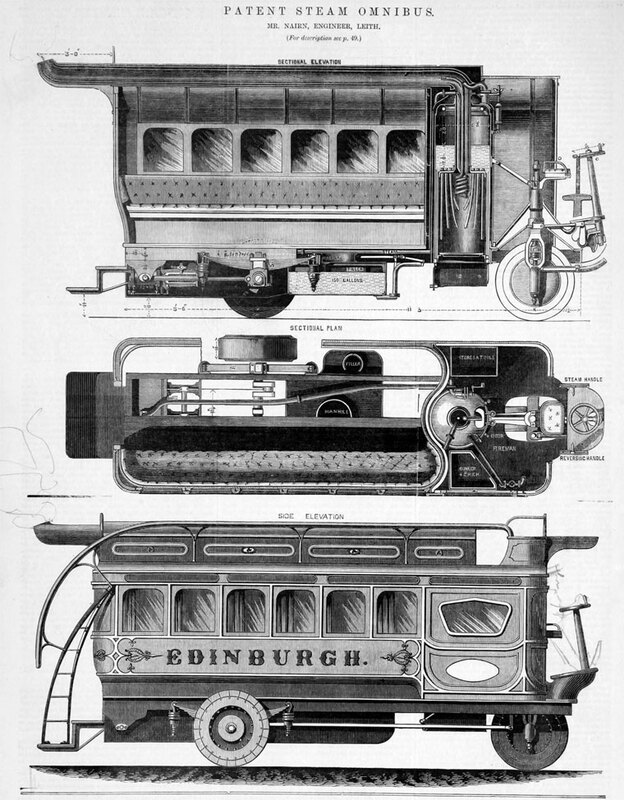 In 1870, Mr. Nairn, of Leith, designed a steam omnibus for service in Edinburgh; it had one leading and two driving wheels, fitted with willow wood on the faces to deaden noise. Three cylinders, each 5.25 in. diameter and 10 in. stroke were coupled direct to the driving axle, which was placed well forward to relieve the weight on the steering wheel; the carriage was mounted upon springs 4 ft. 6in. long, and rubber washers. A Field boiler, 27 in. diameter and 6 ft. high, was used, the funnel from which ran along the top of the 'bus. The boiler was sufficiently large, so as to dispense with the exhaust blast in the chimney. The waste steam was allowed to escape into a box, which made it noiseless. The omnibus weighed seven tons, and seats were provided for eighteen inside and thirty-two outside passengers. With fifty persons on board, the engine ascended a hill, one in sixteen, at eight miles an hour, and ran on the level road at sixteen miles an hour. An Edinburgh 'bus proprietor took up this machine, and drove a heavy trade for a time. During the same year Mr. Nairn built a very neat-looking road steamer of eight horse power, mounted upon three wheels, each trailing wheel being driven through the medium of a friction brake lined with wood. These brakes, it was urged, only required once tightening in a hundred miles run. These friction brakes were adopted so as to dispense with compensating gearing. The engine could be manoeuvred easily. A Field vertical boiler was used on this engine, supplying steam to two cylinders, each 6.5 in. diameter and 10 in. stroke; two speeds of steel gearing. The two driving wheels were 5 ft. 6 in. diameter and 18 in. on face, a section of which is shown by Fig. 69, on this page. It will be seen that the tyre was made of hemp and coir rope. He sometimes used cork and flat pit ropes coiled round a drum or wheel, and protected by shoes on the outer surface. "It was found in practice that when the rope was coiled loosely enough to flatten at the tread of the wheel to the same extent as indiarubber, the resistance became very great through the tyre being soft and not elastic, and the rope was soon destroyed. If the coils were wound round as tightly as possible, the tyre became almost rigid, and the wheel was not more efficient than an iron one." 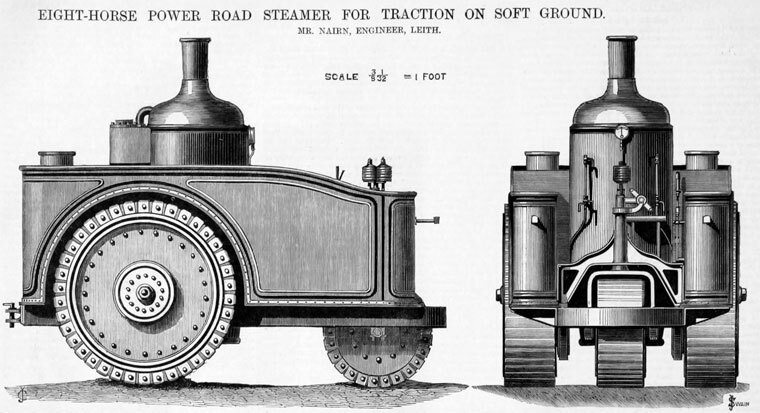 In 1871 Mr. Nairn brought out his self-contained steam omnibus, the 'Pioneer.' Three cylinders were coupled to a pair of 40 in. diameter driving wheels. The funnel from the boiler passed backwards under the seats of the outside passengers, and emerged behind over the conductor's head. The main axle was mounted on flat bearing springs, supplemented by indiarubber washers 4 in. thick. During the summer of 1871, the 'Pioneer' ran for hire between Edinburgh and Portobello, a distance of three miles, and from eleven to twelve runs were made per day. Seats were provided for fifty passengers, and when fully loaded the omnibus weighed ten tons, travelled at twelve miles an hour, was under perfect control, and was successful. An engineering writer says: "Having travelled on business from Edinburgh to Portobello, I have had frequent opportunities of observing the working of this steam omnibus, and it is doing exceedingly well. No horse-drawn 'bus is more under control than this one; its safety and capabilities of doing excellent work are beyond cavil, and invite investigation. Its general construction is a great step in advance." Nairn, like the rest of the locomotionists was more than once summoned before the magistrates and fined for breaking the unreasonable road locomotive laws. 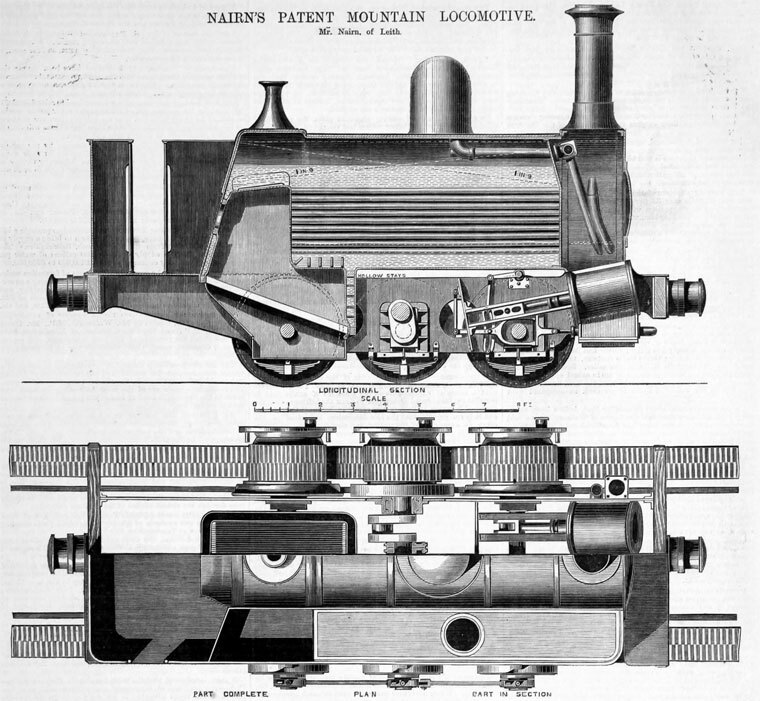 In 1872, Mr. Nairn was having a road locomotive built to his design by Messrs. J. and T. Dale of Kirkcaldy, for shipment to New Zealand. This page was last edited on 29 April 2013, at 10:23.